With the approaching ‘3-day Yom Tov’ this Shavuos, and the accompanying sociological challenges, this essay will reexamine the origins of Yom Tov Sheini shel Goluyos. In early times they used to light bonfires, but on account of the mischief of the Samaritans the Rabbis ordained that messengers should go forth. But now that we are well acquainted with the fixing of the new moon, why do we observe two days? — Because they sent from there: take care of the custom of your fathers in your hands; for it might happen that the government might issue an antisemitic decree and it will cause a blunder. Rashi explains that the inability to learn Torah would lead to confusion regarding the fixing of the calendar. Were they only to observe one day of Yom Tov, their negligence might result in an error concerning the calculation and setting of the correct day of Yom Tov. The Meshech Chochma (Bo ch.12 s.v. Uvazeh), however, asks: What makes the Diaspora unique in this regard? Theoretically, such a decree could also be enacted in Eretz Yisrael, causing confusion around the correct day of Yom Tov! Taking a different approach, let me ask: In the twenty-first century, no matter how far removed one might find oneself from Eretz Yisrael, and no matter how terrible the decrees regarding observance of Torah and mitzvos, with the ease of communication, does it not stand to reason that nobody should risk keeping the wrong day of Yom Tov in error? The case for 2nd Yom Tov seems to be quite difficult to make! I would like to suggest a different understanding of the Gemara, based upon the unique wording used. “They sent from there: take care” appears only twice in Shas – first, here in Beitzah, and second, in Nedarim. Before examining the other Gemara, let’s establish the meaning of ‘they sent from there.’ The Gemara in Sanhedrin 17b explains that it refers to the rulings of Rabbi Elazar ben Pedas, who was born in Bavel and later went ‘there’ to Eretz Yisrael. Shmuel said: Arbuvisa of the head leads to blindness, arbuvisa of clothes leads to dementia, arbuvisa of the body leads to boils and sores. They sent from there: take care of arbuvisa. Take care to learn Torah in the company of others. Take care with regard to the education of the sons of paupers, for from them Torah will issue forth. What is the meaning of ‘arbuvisa’? “Rashi” and Ran (ad loc) suggest that, at least for the first section, the meaning is ‘uncleanness.’ In the second section, however, that meaning does not seem to fit into the context of the other warnings, which deal with the maintenance of Torah life. Elsewhere, the same root-word refers to a mixture, or mix-up (e.g. Nedarim 20b). In that light, its meaning of ‘uncleanness’ would refer to when good and bad elements are ‘mixed’ together. It would appear that the message that Rabbi Elazar sends from there – Israel – to the Diaspora, is one of Jewish continuity. Take care not to get mixed up with (or become spiritually ‘unclean’ on account of) the gentiles around you. Take care to promote communal Torah learning. And take care that every child gets the opportunity of a good Torah education, irrespective of their family background. Let’s return to our Gemara in Beitzah. At great personal cost, Rabbi Elazar had made Aliyah. And yet, they still looked to him for spiritual guidance, even vis-à-vis their diasporic lives. Here they are, ready to give up on 2nd day Yom Tov, which appears to be obsolete. What’s his instruction to them? Take care! I want you to be aware of two pitfalls! Number 1, this tradition was observed by your parents before you. If you start changing traditions, what anchor will your children have for their traditions? And number 2, living in the Diaspora leaves you at the mercy of the gentile rulers who could attempt to uproot your Jewish practices. If you wish to maintain your Judaism in the Diaspora, you’d best be advised to keep things 100% intact! The minute you start tampering with the tradition, the foundation of your Jewish practice in the Diaspora is pulled out from beneath you! 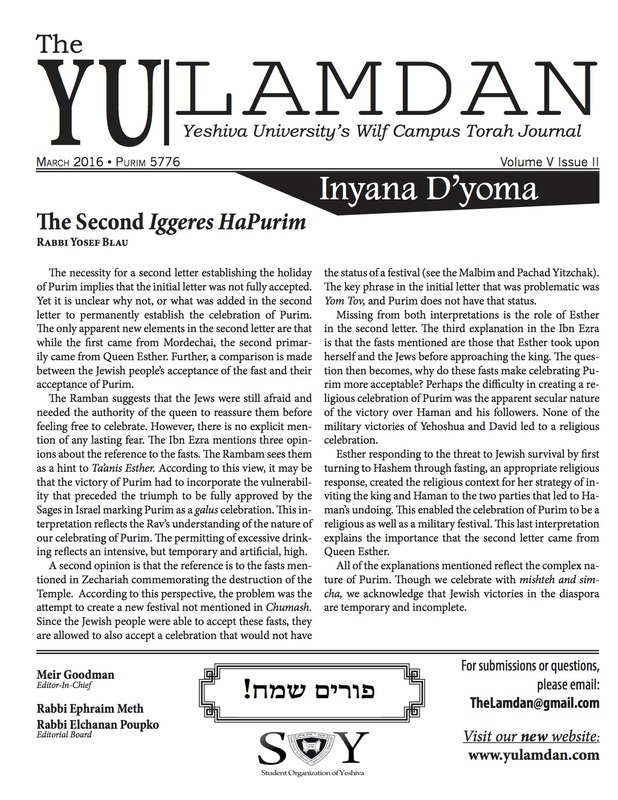 Why do we keep 2 days of Yom Tov in the Diaspora? It’s a constant reminder to us that we don’t belong here! In Talmud-speak, it’s like a ‘kenas’ (fine) imposed upon us by the Rabbis in Israel (Rabbi Elazar, specifically) for remaining in chutz la’aretz. Every time we book two days off work, every time we make a second kiddush, we are reminded that we simply don’t belong here. 2nd day Yom Tov is the wake-up call that we have yet to enter the Promised Land. May we all be zocheh to make Aliyah speedily! Rabbi Daniel Friedman is the incoming rabbi of Hampstead Garden Suburb Synagogue, London, UK. For the last sixteen years, he has served Beth Israel Synagogue, Edmonton, Canada. He has semicha yadin yadin from Rav Gedalia Dov Schwartz and is a Ph.D. candidate in International Relations at the University of Alberta. He is a vice president of the Rabbinical Council of America.